So your baby’s gotten big enough for a toddler pillow in their bed? But choosing the best toddler pillow can be a bit confusing, there’s a lot of choices but not a lot of information. Which is why I put together this guide, to explain everything you need to know and show you some of my favourites. I’ve got a quick look at my top choices for the best toddler pillow below, just click the name to see more info, the price and order yours. Toddler pillows are smaller than adult pillows which is handy if you need it for inside a cot or a cot bed and because they’re not as tall. You don’t want your little one to strain their neck just trying to lie on their pillow after all. It really varies for every child, in general, you shouldn’t really use a pillow before they’re 2 years old according to The Baby Center, but a lot of pillow manufacturers say after 12 months old. And there are a lot of Mums on Net Mums who have had a huge range of ages some as young as 3 months to help stop acid reflux and others as old as 4 because their child just didn’t like them. So it’s up to you if you don’t have a specific reason for needing your baby on a pillow then feel free to wait till they’re older. But only you know your child the best. Memory Foam is always a good choice because it softens under your child’s head to give them the exact support they need. It’s also completely hypoallergenic and lasts a really long time, ideal if you’re having more than one child. Wool is another great choice because it is completely natural and naturally fire retardant so it doesn’t need to be treated with any chemicals. The width and length all depend on how big your sleep space is, as long as it comfortably fits on the bed/cotbed/cot whatever you have it’s ok. The important thing is the height, like I said you don’t want a 12 cm tall adult pillow you want something much flatter and closer to the 3-7 cm, you 3 cm for memory foam and 5cm for something softer like wool. Hypoallergenic toddler pillows aren’t absolutely essential because they’ll only really make a difference if your child has allergies. But when they’re that young it’s hard to tell so I’d always recommend going with a hypoallergenic pillow just in case. And we’ve made it! I’ve gathered together some of the best toddler pillows in the UK and given a short review of each. And I’ve linked each through to where you can buy them so you can order yours today! The Panda Toddler pillow is a great choice, it’s made from odourless memory foam so you can use it right out the box and has a soft bamboo cover. Bamboo is a really special material because it’s naturally climate controlled keeping your little one cool but comfortable and it’s naturally hypoallergenic and a completely sustainable material. It’s got a contoured shape which helps fight against flat head syndrome and the memory foam allows proper alignment of the neck and spine. This gives that little extra support ideal for growing toddlers. Overall, it’s an absolutely outstanding toddler pillow and one you won’t go wrong with. Little Green Sheep are masters of organic baby bedding, a perfect choice for the eco-conscious. The wool filling is all natural and the 7 cm height is at the top end of height but it will be squishy enough to flatten down and come to rest at the perfect head height. The downside is it’s quite pricey and there’s no cover included but organic always is. You still get a very comfy pillow for your toddler that is safe and healthy. 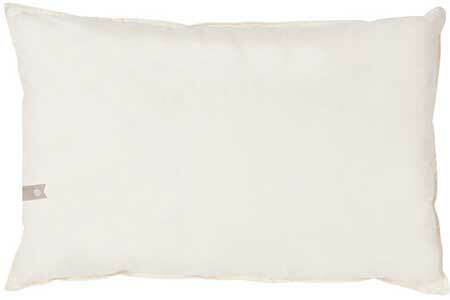 Overall, a great organic toddler pillow for those looking for a natural option. The Clevamama toddler pillow is technically filled with Clevafoam not memory foam. It’s still a type of memory foam but it doesn’t trap heat as much and is a lot more breathable. It supports and reduces pressure to the head which helps prevent flat head syndrome and provides ideal support for the neck. It’s quite tall for a memory foam toddler pillow so if your toddler is very small they might find it a little uncomfortable having their heads so high. But that is only if they’re still very young, I’m sure they’ll quickly grow into it! Overall, the Clevafoam makes it nice and breathable and altogether a great firm toddler pillow for those worried about flat head syndrome. What Can I do After My Toddlers Outgrown Their Pillow? A handy thing about toddler pillows is that they also make great travel pillows! So once they’ve outgrown them you can still keep them aside for long car trips or flights where a nice small pillow will just be perfect. Can Kids Use this pillow? It’s hard to define where your child goes from baby, to toddler, to kid. So I’d say yes as long as they’re comfortable these would be some of the best kids pillows. How Do I Know When My Toddler Pillow Needs to be Replaced? You can usually tell by the quality of the pillow if it feels lumpy, or if it smells bad at all it’s time to chuck it and get a new one. There’s no secret really just use your better judgment and decide if you’d be happy sleeping on it.